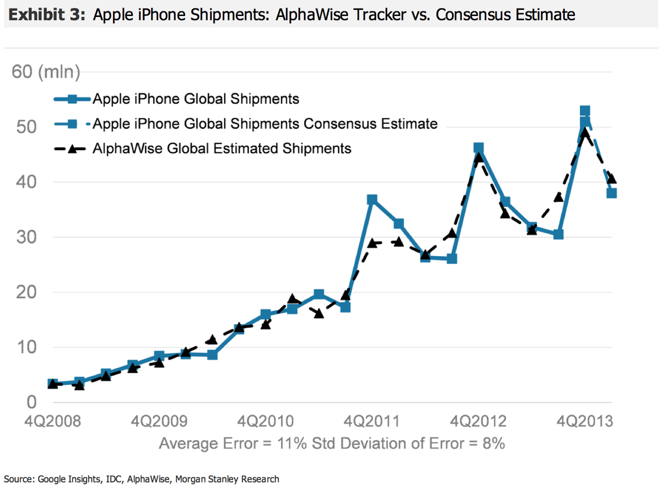 Analyst Katy Huberty believes shares of AAPL have been "de-risked" ahead of upcoming product cycles, she said in her latest research note, a copy of which was provided to AppleInsider. If investors are on the fence about Apple stock, she said now is the right time to buy in before upcoming growth. Morgan Stanley's Katy Huberty expects Apple will enter the mobile payment and wearable devices markets. Specifically, she said her recent analysis shows that Apple stock tends to improve after periods of growth in research and development, as the company invests in new product categories. She cited R&D investment ahead of the launches of the iPod in 2000 and 2001, before the iPhone in 2005 and 2006, and ahead of the iPad in 2008 and 2009. Similar to those periods, Apple has kept its R&D spending growing more than 30 percent year over year for the period between 2010 and 2013. 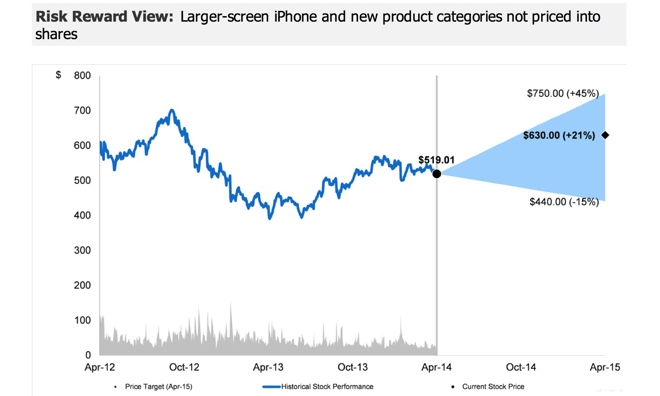 In Huberty's view, it's "likely" that some of Apple's recent investments were in new product categories. Specifically, she expects that Apple may be about to enter the mobile payments space, and could also make its first official foray into the wearable connected electronics market. In addition, investors are currently underestimating both Apple's ability to innovate and launch new products, as well as the value of its existing user base, many of which have active iTunes accounts with connected credit cards. Even before Apple launches new products, Huberty also believes that institutional ownership of Apple stock is too low. She already highlighted this trend in February, when her research found that institutional investors' stake in Apple was at a new 5-year low. The analyst also believes that iPhone demand may have been slightly better than expected in the just-concluded March quarter. A recent survey by Morgan Stanley and AlphaWise suggests to her that Apple may have sold 38 million units in the three-month span, and she sees the potential for "modest upside" to that estimate. She sees the potential for Apple to report revenue of $44.5 billion for the March quarter, with gross margin of 38.2 percent and earnings per share of $10.80. Finally, Huberty also made note that Apple bought back at least $14 billion of its own stock last quarter. Assuming a share price of $500 around the time that the buyback occurred, the analyst calculates that the buyback could add 19 cents to earnings per share for the March quarter. With a strong recommendation for investors to buy AAPL, Morgan Stanley has maintained its price target of $630 with an "overweight" rating. The increase to that target was made in December.